Happy Father's Day. And happy World Chocolate Day! Yes, you can combine the two with lots of chocolate for Dad. Perfect. I thought you'd like this pic. 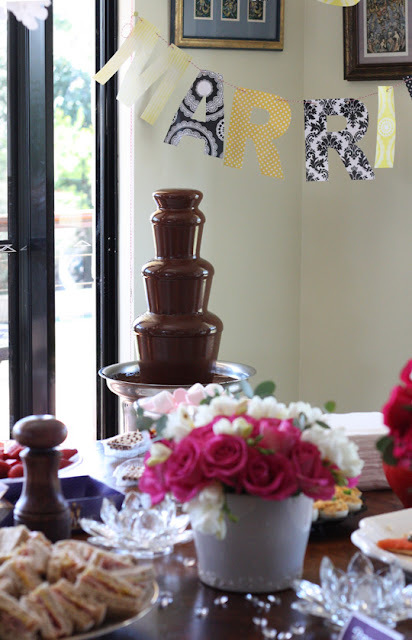 This is a special shout-out to my Dad too - this is one of my Dad's chocolate fountains at my sister's post-wedding brunch last weekend. It was glorious. Dad runs a great chocolate fountain fondue business in Brisbane, on the Gold Coast and the Sunshine Coast in Queensland, providing professional chocolate fountains and warm, melted Belgian Callebaut chocolate for weddings, baby showers, birthday parties, engagements, trade shows, business meetings and all sorts of events. Dark chocolate is the most popular, but there is also milk chocolate and white chocolate to choose from (and pink or coloured if you wish!). Our girls have been so lucky to have chocolate fountains at their birthday parties and the kids and adults alike have all loved it. We like to dip strawberries and marshmallows on skewers, and ginger and pineapple are pretty fabulous too. Enjoy your chocolatey Father's Day! World Chocolate Day! Now that is something to celebrate.